You've already designed and built the swimming pool of your dreams — how will you ensure a long life for it, one that offers you years of summer enjoyment? The answer is year-round swimming pool maintenance that cares for every aspect of your swimming pool. Not sure where to start? Download our printer-friendly swimming pool maintenance checklist that outlines all the maintenance tasks you'll need to complete — in the off season and at the peak of the summer season — to keep your pool running swimmingly. Don't delay! 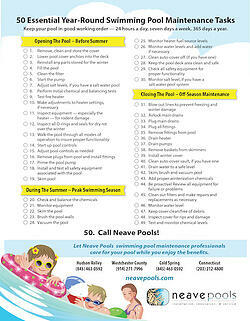 Download our FREE Swimming Pool Maintenance Checklist today by filling out our simple form.